Solar ventilation preheat refers to a solar wall or transpired solar collector, which heats air before it enters a structure. It provides a very efficient method of lowering a building energy costs with a clean renewable source of energy. Invented by engineer John Hollick of Conserval Engineering, the concept of employing a transpired solar collector-air preheating system, has been in use since the 1990s -- under the name Solar Wall. The National Renewable Energy Laboratory conducted significant research into the technology during the decade of the 90s. The National Renewable Research Laboratory conducted significant research on the technology during 1990s. The technology was licensed to Atlas, International, which specializes in manufacturing metal roofing, wall, ceiling panels and accessories for commercial and residential buildings. The company uses the trade name Inspire Wall for marketing the product. 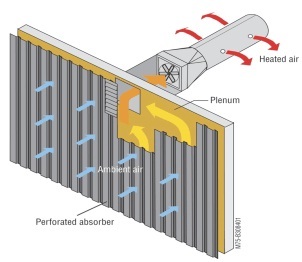 The basic system heats exterior air, with the aid of a solar collector situated near a southeast- or southwest-facing wall, ideally near the building's ventilation system. The collector consists of a dark-colored wall made of aluminum or corrugated steel. The wall has numerous perforated holes. The system pulls air through the holes. As the air comes through the openings, it absorbs the heat in the wall. Warm air rises between a 4 to 6 inch void, or plenum, situated between the solar wall and the structure. Brackets secure the solar wall the building. A ventilation fan- usually installed as part of the existing ventilation system-moves the treated air from the plenum into an air-handling unit. The system distributes the warm air to various spaces within the building. Make-up air, drawn through ceiling-mounted ducts gets rid of stratification, which occurs in of structures with high ceilings. Stratification refers to layers of warm air that rises, with the warmest air at the top. Usually, a solar ventilation preheat collector has components called actuated bypass dampers installed on the duct leading from the collector, and exterior air damper. When the control calls for heat, the exterior air damper closes and the solar ventilation preheat simultaneously opens. The unit works in reverse if the building does not need heat. The installer seals the edges around the wall, windows, panel, doors, and other objects with flashing. The flashing has insect mesh and weep holes to allow water drainage. Besides collecting solar energy from the sun’s radiation, the system can recapture wall heat loss. Some buildings may require a convention HVAC unit at night or on cloudy days. Solar ventilation preheat systems preheat ambient air up to 30 degrees Celsius (54 degrees Fahrenheit). Depending on the building size and needs, the system reduces part of the entire load on the conventional heating system. In the summer, the outside air completely bypasses the solar collector to avert preheating the air. Solar ventilation preheating systems have a wide range of applications, especially in industrial and commercial facilities that require a significant ventilation system. Warehouses, storage buildings, laboratories gymnasiums and high-rise apartment buildings that have an ongoing need to ventilate may also benefit from ventilation preheating systems. Building owners can have a preheating ventilation system incorporate into the design of a new building or as part of a retrofit project. Since the system does not require much mechanical equipment, or moving parts beyond the cost of the heating, ventilation, and air-conditioning (HVAC) system. The solar collector's perforated wall does not require a glass cover, which covers glazed flat-plate solar collectors. Systems have an efficiency of up to 80 percent and do not require a storage component. • Length of the heating system-- the system works best in sunny and cold climates. • Price of the energy source for heating; higher energy costs make the system more economical. • Square footage of the south-facing wall must have adequate surface space to attach the solar collector, and make it visually pleasing. It typically requires one square foot for each four to ten cubic feet of air per minute. • The building must have a specified minimum ventilation requirement in accordance with American Society of Heating, Refrigerating, and Air-Conditioning Engineers Standard 62. Solar preheating ventilation systems work best in structures that have significant volumes of outside air ventilation loads. Like most solar applications, the O&M for solar ventilation preheat systems makes it an attractive solution. In most environments, rainfall provides sufficient cleaning of the collector. In extremely dirty or polluted settings, collectors may require more deliberate cleaning. Avoid painting collectors, which can plug the perforated holes. The fan maintenance includes lubrication of the bearings. The fan drive requires replacement periodically. However, this particular component usually requires theses O&M functions for the ordinary operation of the HVAC system. System owners typically contract with an energy service firm to ensure best performance of the system. According to the National Institute of Building Sciences, the cost for a building retrofitted with a solar ventilation preheat application, which includes the transpired collector, accessories , installation and other cost will total out at $30.00/ft². Between 1990 and 2009, 1,500 solar ventilation preheat systems-- covering 3.3 million square feet, have been installed around the globe. The United States have about one-third of the units. Canada, Germany, France, Italy, Malaysia, and Indonesia also have systems in place. The type of fuel burned by the primary HVAC system, and the costs, determine system’s cost-effectiveness. The return on the outlay for new systems ranges from 3 to 4 years. The pay back for retrofit systems runs between 6 to 7 years. NREL assessments show the low cost and high efficiency attributes of the solar ventilation preheat collector technology makes it more competitive with natural gas or more costly fuels, such as electricity and propane. 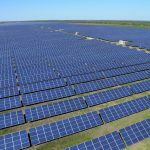 Ultimately, the financial feasibility of the system depends on the heating needs of the building and the available solar resources of the region.